My husband Nazim and I had the great pleasure of attending the opening of Sue Wong’s Spring Collection Friday evening at the Conga Room at LALive! 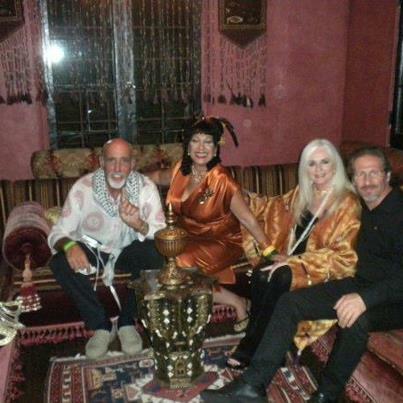 I have been around the world of fashion since the early 1960’s in Los Angeles, New York and Europe both as a model and actress, however these days my focus in on advocating for health on the inside through my husband Nazim’s and my Art of Wellness Collection which I share often here at my blog however in all the years I have been around fashion I don’t think any collection or any runway show has ever moved me as much as this one did. This is all thanks to the extraordinarily talented Sue Wong herself. Let’s start at the beginning. Sue Wong’s theme of “Spring Transcendent” for her 2013 Collection which, Friday, September 21, 2012 at 6:30pm at LA Live’s The Conga Room, 800 West Olympic Boulevard, Los Angeles CA was certainly one which will be remembered for years to come as this event was filmed in 3D for Othila Media’s documentary “Fashion and Culture in Los Angeles”(director/producer Catherine Bauknight, associate producer Leann Vasquez), which shares our city’s contribution to fashion, art and music. We were all given the 3-D glasses and occasionally got glimpses of ourselves. The pre-show crowd enjoyed cocktails from 4 to 6pm sponsored by The Conga Room, 3opolis, the Dream Factory as well as Grey Goose, Corona, Bacardi and Red Bull. Red carpet arrivals took place from 5:30 to 6:30pm and 500 leading fashionistas, celebrities and socialites attended the showing of Sue Wong’s very latest collection that celebrates modern lifestyles through the lens of nature’s seasonal metamorphosis. Looking smashing was, America’s Next Top Model winner, Eva Marcille. More red carpet attendee’s can be glimpsed here. The theme for this poetic collection has been memorialized in the writings of poets Ralph Waldo Emerson and Henry David Thoreau who contemplated the divinity of nature and humanity. One could liken these garments to petals separating from stems and floating, bejeweled and be-feathered on wings down the runway. These gorgeous garments hug the body but still move with the wearer and come in a variety of lengths from above-the-knee with asymmetric hems to floor length gowns which are perfect for award ceremonies, weddings and occasions. The colors embodied spring melding from creams, pewters and platinums to champagne and pyrite. Of special brilliance were the peacock colors of soft and vibrant blues and pistachio greens. In stark contrast the yin of glacial white juxtaposed to the yang of midnight ebony for the finale made the entire show come together in a crescendo of glamour straight out of the Erte-like art nuveau glamour of another Hollywood era wrapped up in sublime poetic illuminations! 3DFF, the world’s largest all-digital 3D Film, Music, and Interactive Festival, celebrates its fifth anniversary at its new location inside Regal Cinemas L.A. LIVE Stadium 14, with additional activities taking place at the JW Marriott Los Angeles, L.A. LIVE, The Ritz-Carlton Los Angeles, Club Nokia, The Conga Room and The GRAMMY Museum, all located within the L.A. LIVE sports and entertainment district in downtown Los Angeles. The three-day festival, presented by RealD, 3net and LG Electronics, opens Thursday, September 20th and runs through Saturday, September 22nd with multiple world premiere red carpet screening events, 3D gaming as well as live performances in fashion, music and comedy. 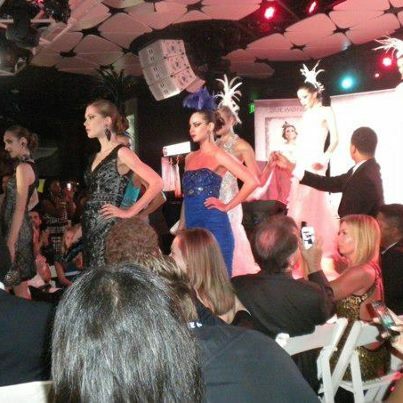 Designer Sue Wong at her Spring Transcendent Fashion Show at The Conga Room at L.A. Live! Let me give you a little background on the amazing Sue Wong by presenting her biography! SUE WONG is a study in contrasts. She appears petite, yet possesses a commanding presence and grand energy that fills an entire room. While there is power and strength in her designs, there is a romantic fantasy and poetic lyricism that informs her work, which nonetheless remain rooted in undeniable pragmatic reality. The elegant economy of her gestures belies the strength and determination with which she has managed her business for over two decades. This collision of polar opposites creates the frisson that fuels Sue Wong’s gorgeous designs and has established the Sue Wong signature style.Born into humble circumstances in a remote countryside in southern China, at the age of six, Sue was spirited away from Communist China by the courageous leap of her mother, who bribed a border guard with her wedding jewels in exchange for freedom into Hong Kong with her young daughter. Journeying to the United States a year later, mother and child reunited with Sue’s father in Los Angeles. As a child, her initial creative tendencies drew her to art. The daughter of struggling immigrants, there would be no budget in the spare family economy for toys; Sue would create her own paper dolls and their entire lavish wardrobe, practicing her nascent interest in Fashion Design. However, Sue started making her own clothes when she was nine years old. In High School she was chosen from over three hundred female classmates to be a member of the May Company Teen Board, and landed the opportunity to work in various capacities including modeling, assisting in window display and merchandising. While she was still trying to earn a fashion degree, she interned with the resource brand Arpeja, after winning first place in a scholarship sponsored by the company, apprenticing under the head designer. Sue Wong left Arpeja to open up a one-of-a-kind boutique shop in Bohemian Venice, California, and later, another upscale boutique in West Hollywood with a stunning Art Deco interior. It was during this period that her signature vintage style was born and solidified. Sue took details from vintage garments from the Twenties, Thirties and Forties, extracted the hand-made detailing such as beadwork and embroidery and redesigned an entire new garment, incorporating the detailing of the vintage embellishments into her new design. These elaborate creations were displayed and hung from wires suspended from the ceiling to create a gallery effect in her boutiques. She attracted a glamorous audience and following including Bianca Jagger and Goldie Hawn who were drawn to the beauty, magic and uniqueness of her designs.Ironically, after two design stints with smaller companies, Sue returned back to Arpeja to claim the position of chief designer for the label’s Young Edwardian. She became an immediate stellar success, bringing the company’s sales from a mere 2 million dollars in revenues of over 52 million dollars within a three year period–a stunning, unprecedented success for the times.Her attempt at launching her own line at age 30 was ill timed. She was in the midst of an acrimonious divorce and raising two young sons. Undeterred, she relaunched her brand five years later, rolling out an initial collection of Sue Wong day dresses to critical acclaim in 1985. Eventually, she introduced more elaborate evening pieces in 1999, a move that would firmly establish her signature style of haute glamour, femininity and romantic vintage sensibilities.With each new collection, Sue Wong never fails to astonish, employing the revered age-old couture techniques implemented by the finest Couture houses in Europe, and evoking the allure and glamour of various eras such as Weimar Berlin, 1930s Shanghai, Precode Hollywood and Manhattan’s gilded Jazz Age. While often adopting vintage style, every design belongs in the now and is decidedly very Sue Wong; exquisite fabrics shimmering with incandescent beads, unique embroideries and layered textures embellished with passementerie and soutache combine to create works of art that are graceful, elegant, unique and timelessly beautiful.Sue Wong truly captures and embodies through her work, her mantra of Beauty. Magic. Transformation. It is the Eternal Feminine Goddess energy that Sue Wong aspires to honor in every woman, creating beauty and sorcery that both enchants as it empowers, leaving a trail of wistful romantics speechless in its wake. For a taste of the Beauty, Magic and Transformation that Sue Wong offers her clients, see her website. Following the fashion show Nazim and I attended the 3DFF after party at the Ritz Carlton and had the pleasure of visiting and chatting with image consultant Bernard G. Jacobs and his companion Fiona, who were just as impressed by this study in poetic fashion presented as I was. It was then on to Barbarella Restaurant for us to join Sue Wong and some of her friends and several of the models for dinner. 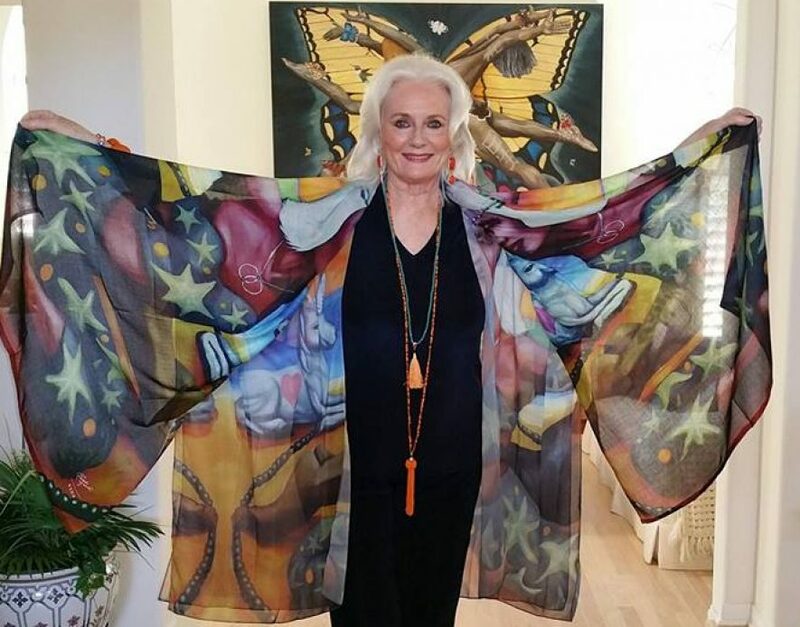 There we met the beautiful, producer model and philanthropist, Linda Taylor who kindly posed for a photo with me in her gorgeous finale ensemble she wore last in the fashion show. I am wearing for the occasion an antique Japanese Priests ceremonial Kimono over basic black. Following our late supper it was on to Sue’s magnificent home in the Los Feliz district of Los Angeles , just minutes from where I grew up, having graduated from John Marshall High School! Here at her beautiful home everyone could relax in these beautiful surroundings! 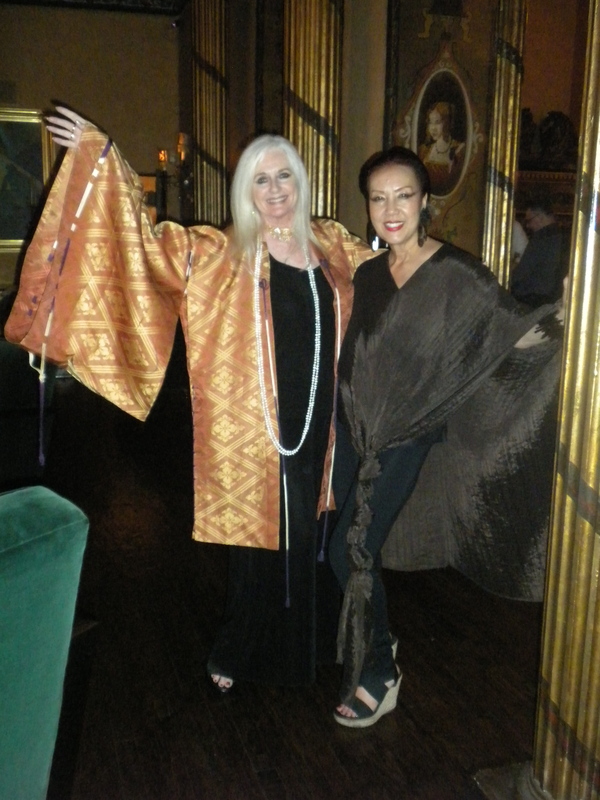 Then we all danced and danced ’till the wee hours and celebrated the tremendous success of our beautiful friend Sue Wong! PS: Sue often uses her home (see photo below) as a backdrop for showing her magnificent collections and I cannot think of anywhere more beautiful to do this! I am greatly humbled by the largesse of your utmost generosity in this wonderfully laudatory tribute. I was ever so excited to meet you and your brilliantly talented husband, the poetic visionary, Nazim. You are a true high priestess and Nazim an extraordinary multi-dimensional creative energy. I am honored to know you both. 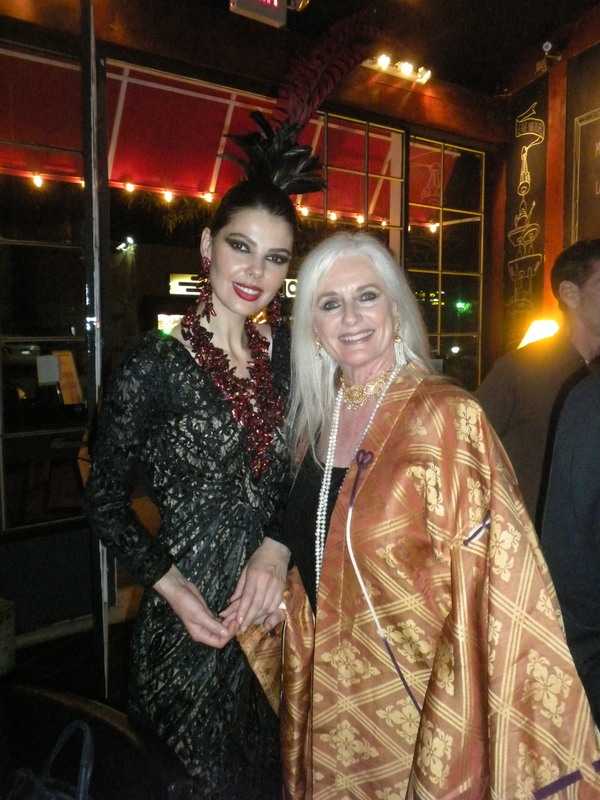 It was a wonderful evening with the Opulent, gorgeous, vivacious Sue Wong! She produced a fantastic line and of course the show was exquisite! She picks out all her own music and it’s always fanominal! In addition it was so to have dinner with Sue and her guests and after enjoy Sues Wonderful home , “The Cedars”. I especially enjoyed meeting the great new friends like Celestial and Nazim. They were a delight! And we had such a nice time dancing! It’s great to see Women celebrate life and enjoy themselves so much. Sue changes her beautiful gown into another more casual bue fantastic outfit and dances into the night …she goes on and on, what energy!